I completely understand the urge to reach for something to take the edge off though. What do I reach for? Today I had to deal with this one resident who tests my patience like nobody else on the planet. She tests everybody’s patience so don’t go judging me and thinking I’m the only one who has an issue here lol She’s a nice lady, just…shrug, high maintenance? Something that should take less than 5 minutes to sort easily takes 30 minutes cause of how she does things. If it is quiet then it’s fine but today I had line ups at the desk, every phone line ringing and she was being super high maintenance, as in suuuuuuper high maintenance! As in omg I want to hit my head against a wall to get out of this situation because that would be less painful! After I was done helping her I actually sat at my desk, head in my hands, exhausted from the ordeal. I also actively had the thought “I need chocolate. Desperately need chocolate.” Fortunately, or unfortunately (depending how you want to look at it) we had some lovely Purdy’s chocolates at work and oh boy did I snack! Three! 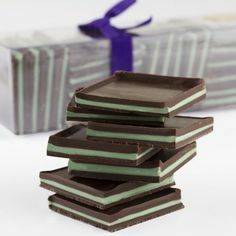 I ate three amazingly delish chocolates, they are two layers of chocolate with a layer of mint in between, it was my first time having them and I can easily say they are ranking up there as a new fave. Mmm! Mmm! Chocolate and mint, one of the best combos ev-ah! I don’t use food for any of those reasons as much as I used to, or at least I don’t think I do, but I can definitely remember a number of times when I used food for those reasons. I remember after a photo shoot a couple years ago, it ended around 9pm and I hadn’t eaten since breakfast so I was starving, as a way to celebrate an awesome shoot I bought pizza and dessert breadsticks on the way home from Panago. I justified the meal because (1) I hadn’t eaten in a freakish long time and (2) celebrating a great shoot. Ridiculous right? I’ve had other similar situations and it’s, sigh, it’s just a dumb way to use food. I try to get my thinking to change to “food is fuel” but it’s hard. So many people socialize around food, or celebrate around food, or mourn around food, food is used in so many situations that I guess it’s a natural progression to food becoming a source of comfort, a stress reliever, a way to celebrate. hmm, should I eat that waffle? yeah, it’s ok, I’ll eat it because I am going on a 15km hike same day so it’ll balance out. do I splurge and share the appetizer with my friend at dinner? yeah go for it! you’re going running tomorrow morning then to dragon boat practice tomorrow evening so you’ll burn it off no problem-o. Now, you might not think there is a huge problem with those thoughts, I mean sure, I shouldn’t have the waffle at breakfast or split the appetizer at dinner but a little treat every now and then isn’t gonna kill me (immediately…lol), the problem is when the planned activity doesn’t happen. In those above instances the hike got cancelled due to being called in to work and the running and dragon boating got cancelled because of sleeping in (ok, fine, my bad!) and such an extreme wind storm the club cancelled boating practice. sigh. The end result was I ate calories I wouldn’t of normally eaten because I was oh so sure I was going to be doing enough physical activity to counteract the calories but then ended up not doing anything to counteract the food I stuffed in my face, double sigh. It isn’t so bad if it happens once in a blue moon, I mean, if it had only been the time my hike got cancelled cause of last minute being called in to work then hey, not so bad, I wouldn’t be upset about it. But this has happened one too many times for my comfort level lately, ya know? I’ve been trying to figure out how to better prepare for possibilities like this but really, how do you prepare for the unexpected? I think the only action to take is to be more diligent with the food I eat and be less lenient with treats and splurges. Also, I have to break the idea of eating something and then planning to exercise it off later. Instead it should be reversed. If I want to have a treat of some kind, I need to earn it by exercising first and enjoying the treat later.